Seeds. This is how Andrea Bocelli described them, after infinite hugs at “Jazz at Lincoln Center”. In the rehearsal room, the children sang for him, and then he for them. A unique opportunity, for the future of their country, the “Voices of Haiti” received a standing ovation yesterday on the stage of the “Global Exchange” at Lincoln Center. In their hearts, they already feel what their country can become. Andrea describes ABF as giving the fertile land where people can plant seeds and allow them to grow. Where they can widen their prospectives and fulfill their greatest potential. The second annual Global Exchange speaks of the peaceful power of art, which we can apply on a daily basis. The inauguration is a mix of creative outlets, that have come from all over the world, but are all narrating the same story: of action against oppresion, war and the cruelty it brings. The ABF choir, in partnership with the St. Luc Foundation, has overcome the first challenge of its career: its first performance on stage! Shortly before the debut, during “hair and makeup,” the young choir took advantage of the time off to run around and dance to rap music playing from cell phones in front of our video-makers. 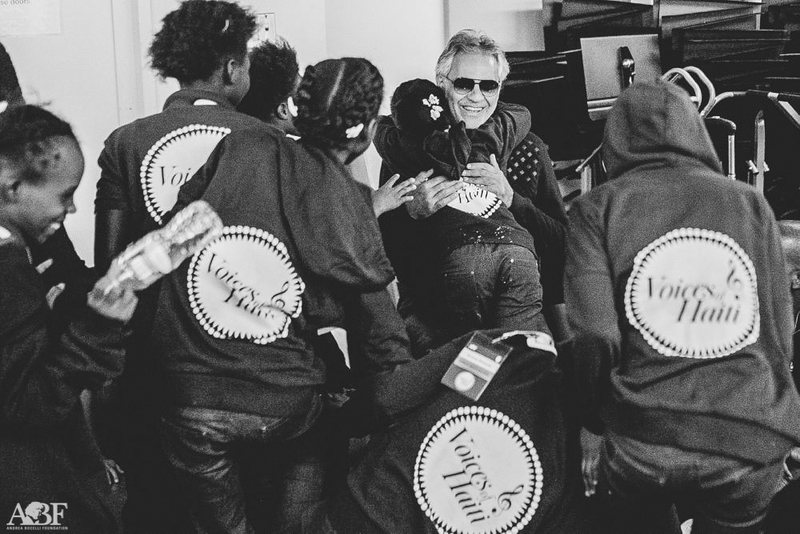 “Voices of Haiti,” has done just what Andrea Bocelli is famous for doing: putting heart and soul into musiIt is now the time for the choir to enjoy their time in New York and to keep performing at their best. c. They filled the audience with an intense emotions, leaving no cheek dry as they sang “Amazing Grace”. Immediately following their performance at Lincoln Center, the choir was brought to “Radio City Music Hall,” whilst making new aquaintances of the likes of Tony Bennet! Voices of Haiti sang once again, this time in front of an even bigger audience, among huge stars including Lady Gaga and Michael Buble in the Big Apple. It is now the time for the choir to enjoy their time in New York and to keep performing at their best. Art is only art if it is done for good, and this is what the Global Exchange is really about.